Some watch styles have become menswear classics that will never go out of style thanks to their heritage, their craftsmanship, their handsome good looks, and, let’s not fool ourselves, their price tag. Never underestimate the power of luxury to make something a classic. If you’ve got $3,000 of disposable income, a classic luxury wristwatch is something you might consider adding to your wardrobe. But what do you do if you like the look of some of those classic luxury watches, but don’t have the money to buy one (or you do have the money, but can’t stomach spending that amount of dough on a timepiece)? Instead of buying a knock-off of an original luxury watch, consider picking up an “homage” to it. An homage watch is one made by another company that takes design inspiration from a classic wristwatch. They’re not exact replicas of the originals (so you avoid the issue of wearing a counterfeit watch), but they look pretty dang similar and evoke the same classic style cues. And they’re affordable. Instead of a few thousand dollars, an homage watch will only set you back $100. Not dirt cheap, but certainly more affordable. 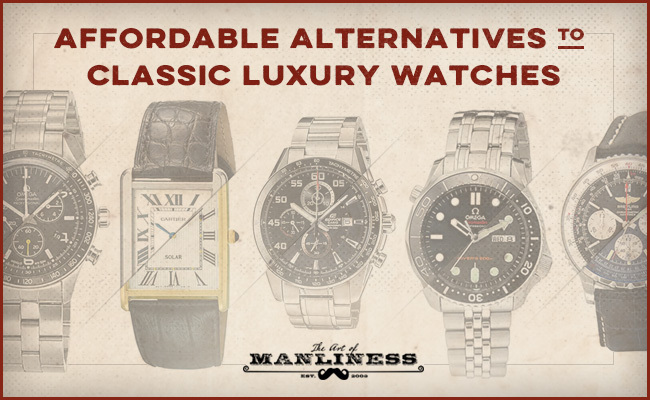 While these homage watches don’t have the same amount of craftsmanship or attention to detail as the originals, they’re accessible alternatives for the man who only wishes for his watch to look good and accurately tell the time. And if you’re worried about losing cred by opting for an homage watch, note that many watch aficionados that own an expensive classic luxury wristwatch will often also have an homage version of it to use as a “beater watch” — a timepiece you wear on a daily basis or when you’re doing things that might result in it getting knocked around. They’ll only bust out their original classic for important events. If you’re in the market for a new watch, below we highlight six luxury watches and their more affordable, homage alternatives. Introduced in 1918, the Cartier Tank’s design was inspired by the Renault tanks that Louis Cartier saw on the Western Front during World War I. It’s a mechanical watch, which means it’s powered by a hand-wound mainspring that allows the second hand to move in a smooth, sweeping motion around the watch’s face. Its simple design has made it a classic dress watch worn by men like Gary Cooper, Cary Grant, and John F. Kennedy. With a price tag of $2,500, though, it’s not cheap. 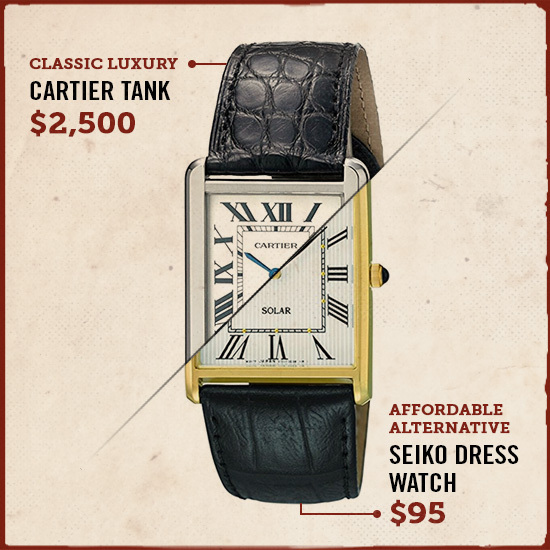 An affordable alternative is a dress watch put out by Seiko. The SUP880 has the same long, rectangle shape of the original Tank and some versions have the same Roman numeral numbering as the Tank as well. Rather than being a mechanical watch like the Cartier, the Seiko is a quartz-powered watch which uses electricity from a battery, and causes the second hand to make a tick-tock sound and move in a jerkier motion. (You can read more about the differences between watch movements and how to choose a watch here.) But quartz watches are more durable than the mechanical variety, and are obviously much more affordable. 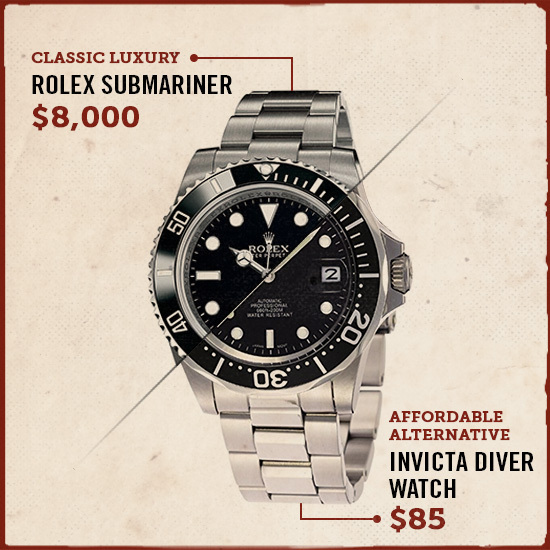 The dive watch is probably one of the most common watch types you see men wear. And we likely have James Bond to thank for that. Ever since Dr. No, the cinematic 007 has been sporting a dive watch of some kind or another. In the early Bond films, 007 often wore a Rolex Submariner. When a man says he’d “like to buy a Rolex,” he’s likely talking about this specific kind. The Submariner looks both sporty and classy at the same time, but, it also costs $8,000. Luckily, there are lots of homage watches of the original Submariner for a fraction of the cost. One such watch is the 8926OB Pro Diver from Invicta. It looks almost identical to the Submariner, but only costs $85. A perfect choice for the sophisticated 00 on a budget. The Omega Speedmaster is pilot’s watch that was used by Gemini and Apollo astronauts in the 1950s and 1960s. In fact, it was the first watch on the moon: both Neil Armstrong and Buzz Aldrin were sporting a Speedmaster during their famous jaunt on the lunar surface. If you’d like to wear the same watch that Apollo astronauts wore, look to spend between $3,000 and $5,000. 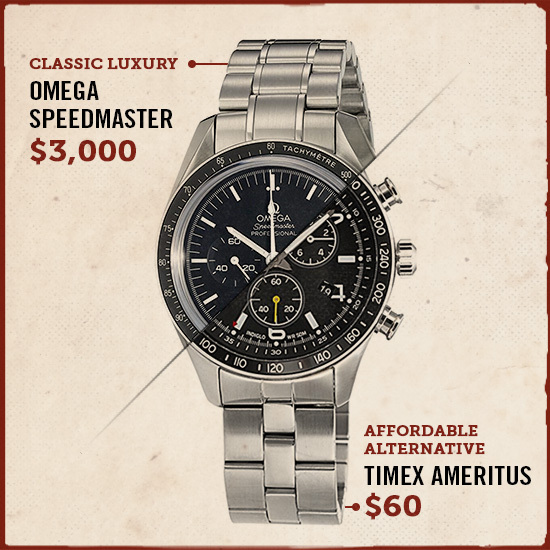 If you don’t have that much money, but like the look of the Speedmaster, check out the Timex Ameritus. I’ve seen several homage Speedmasters, but this one looks the most like the original. Like the Speedmaster, it’s a watch that has a chronograph and tachymeter (check out our article on how to use those features), so you can measure speed and distance. Unlike the Speedmaster, it has a quartz movement and hasn’t been certified for lunar landings. But at $60, who’s complaining? Breitling was the first watch company to put a chronograph and tachymeter on a watch, setting the standard for all pilots’ watches thereafter. In 1952, they took the pilot’s watch to the next level with their Navitimer. Besides the chronograph and tachymeter, the Navitimer also has a circular slide rule that can be used to calculate things like airspeed, rate of descent/climb, fuel consumption, and flight time. Not only is the Navitimer a navigation computer you can keep on your wrist, but it looks incredibly dashing. 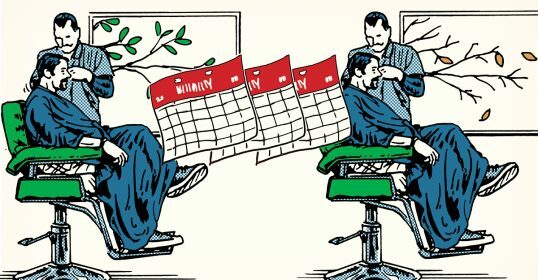 The computational power and good looks come with a hefty price, however. 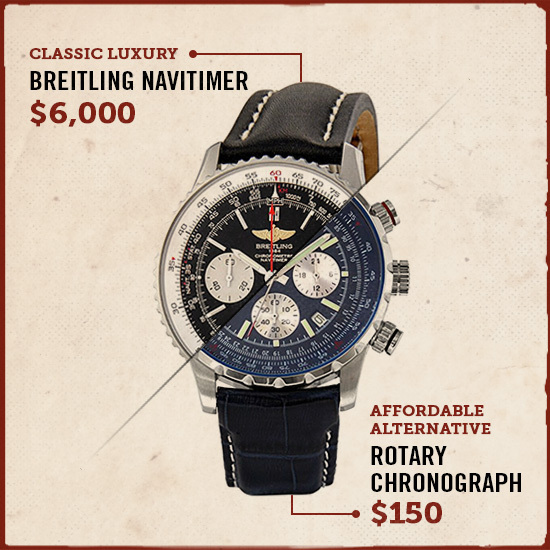 For you aviators on a budget, there’s the Rotary Chronograph. This quartz movement watch has the same romantic look of the Navitimer, but only costs $150. Like the Navitimer, it has a circular slide rule that you can use to measure the fuel consumption and flight time of your (real or imaginary) plane. While the early 007s were Rolex Submariner men, Pierce Brosnan turned James Bond into an Omega Seamaster kind of guy. The Seamaster is a dive watch that’s been a favorite of sporty, well-heeled men since 1948. Joe Biden and Prince William are both fans of the Seamaster. But at $2,000-$4,000, it’s likely out of reach for most average Joes. If you like the look of modern Bond’s favorite watch, but can’t afford to spend a month’s paycheck on it, check out the Seiko SKX007K Diver’s Watch. It has a similar look and feel to the Omega, but only costs $200. 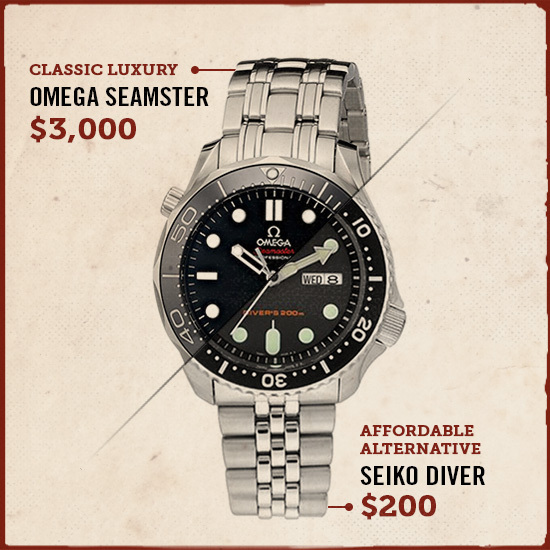 And unlike the other affordable alternatives on this list, this Seiko diver watch actually has a mechanical movement to boot. Tag Heuer has made a name for itself as the go-to watch for race car drivers. 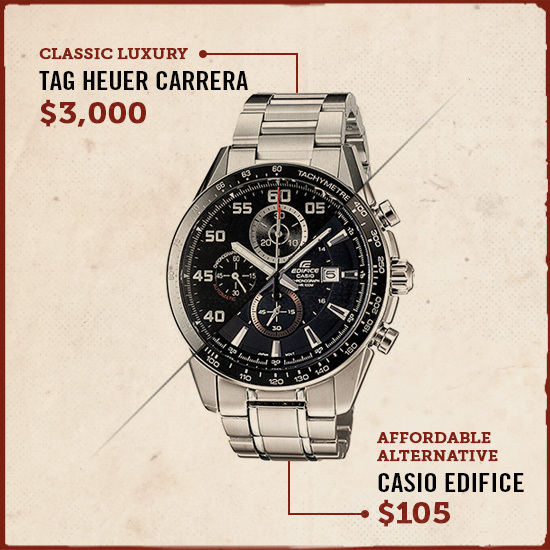 The Carrera is one of their most famous racing watches. It features a chronograph and tachymeter so drivers can gauge speed and distance, and a flashy watch face that oozes accelerated sophistication. But with a price tag starting at $3,000, if the only race car you can afford is a 1999 Chevy Cavalier, it’s likely not an option. The Casio Edifice has the same sporty, driving watch look as the Carrera, but only costs $105. So you can wear it while cruising to the bank to make another savings deposit.